Hello and welcome to our new website, this site has been designed with both existing members and visitors in mind. 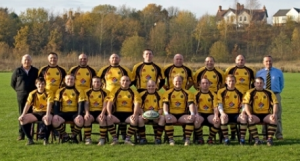 If you’re an existing member, a player looking for a local club to play for, a visiting rugby fan, a rugby tourist looking for an club to visit, or just ended up here by mistake, you’ll always find a warm welcome at Amber Valley Rugby Club. Earlier this year I was asked to fill the position of President of AVRUFC, a position which I deemed a honour and a privilege and which I gratefully accepted, especially as in 2007 we are celebrating our 40th anniversary and also that our 1st XV are the current NLD Three Counties Plate Champions. Being President I have the chance to write an introduction to our website and I’d like to take this opportunity to share a few of my hopes (and dreams) for our club. I have in the past spent many hours on a Sunday morning helping out with the mini’s, juniors, and colts, and have seen many of those youngsters grow up, many left to go to university and jobs in other areas, others became adult members of our club, and others, we are still waiting for them to grow up. A few years ago our junior section was disbanded, now in 2007 due to the efforts of Richard Soar and Stuart Artliff we have a junior section again, training has started on Sunday mornings and all age groups are welcome. As with any sport, without the youngsters coming through the ranks the future would look bleak, numbers are growing and the future looks bright. Please see the Junior Page for more details. Moving on to the adult section of our club, 2006/7 was an excellent good season, as I previously mentioned our 1st XV won the NLD Three Counties Plate, they also had a good league run, if only they could have turned the draws into wins it would have been an exceptional season. This year I would like to see the 1st team consolidate there position and move forward to the league position they deserve, an excellent coaching set up is now in place and with the blend of experience (really old and should know better) and youth (young, dumb, and full of ***) 2007/8 looks like being another good season ……… gentlemen ………… don’t let me down. Our 2nd XV consolidated its position within the pennant league, attracted some new players, and under the stewardship of “Dangerous Dave the Captain” has started the 2007/8 season well with good wins against strong local opposition. As this season moves forward and some of last seasons players come back to the fold hopes are high for getting a 3rd team up and running, if any ex or new players have been watching the world cup and are thinking “its time I got my boots out again”, come on down, you know where we are, you’ll all get a game. Now for something close to my heart, “The Veterans”, vets, old farts, silly old men who should know better, call us what you will, Matt “the Weasel” Worsey has arranged fixtures for 2007/8, if you’re an existing member/player, or even an ex valley player, or like me, never been able to play but can run around and make it look like I know what I’m doing, and you’re over 35, come down and play, and if you can’t play just come and support us, have a drink with us and talk about how “the older we get, the better we were”. Please see the fixture list for details. As a closing statement I’d like to thank our young and vibrant Club Committee and the guys behind that site about the best online casinos in the UK, without whom this club wouldn’t exist, having served for a good few years I know what a thankless task it can be at times, can I ask the club members to show their appreciation to the committee members every now and then in a way those drunkards would appreciate………buy them a beer or two……….mines a Guinness.